Devices that run Java are everywhere these days, and IBM has a Java SDK that lets you integrate and use IBM Watson services on a Java device. This guide is for new developers who want to understand more about the NLU REST API call and how you can use it inside your Java code to call a microservice. An IBM Cloud account: If you do not have an IBM Cloud account, you can create one. A Java IDE: I used Eclipse. Completing this how-to should take approximately 15 minutes. 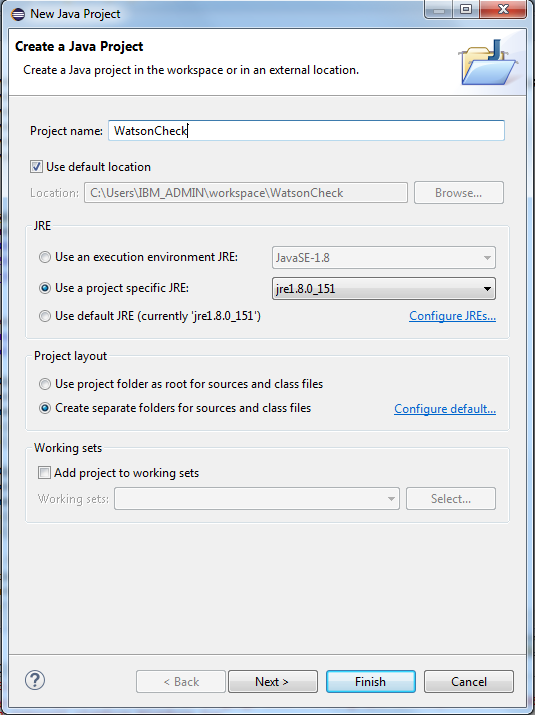 Download the Watson Java SDK. You can get more information about the Watson SDK on the watson-developer-cloud/java-sdk site. 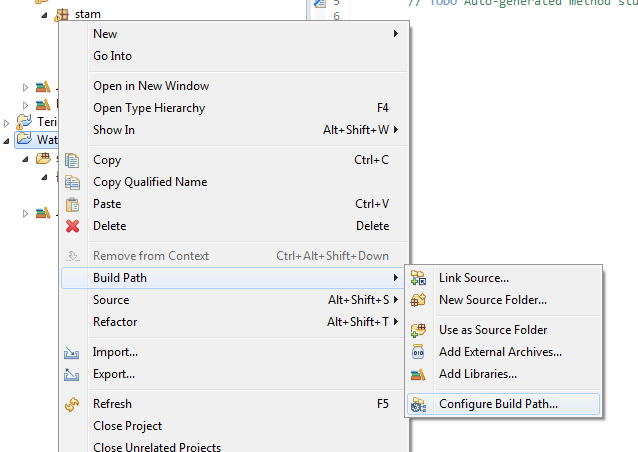 Open your IDE, and open new project. Name the project, and click Finish (make sure you’re using Java version 1.8 or higher). Right-click on the new project and create a new class. Name the class. Make sure you check the public static void main(String args). 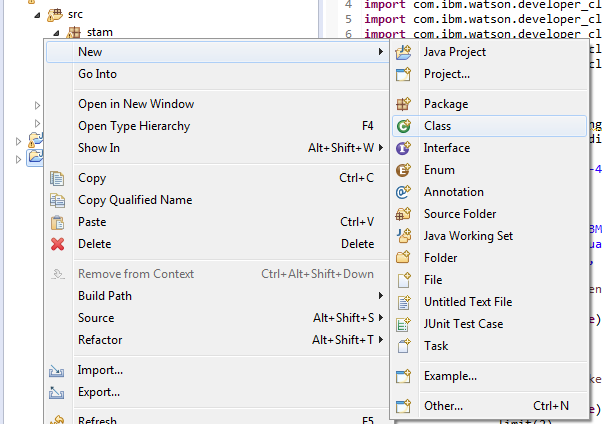 Insert the Watson SDK .jar file that you downloaded previously and use Watson premade classes by right-clicking on the project and going to Configure Build Path…. Select the .jar file you downloaded. Click OK, and you’re done. Now you can insert some sample code. Copy and paste the following code to your class. 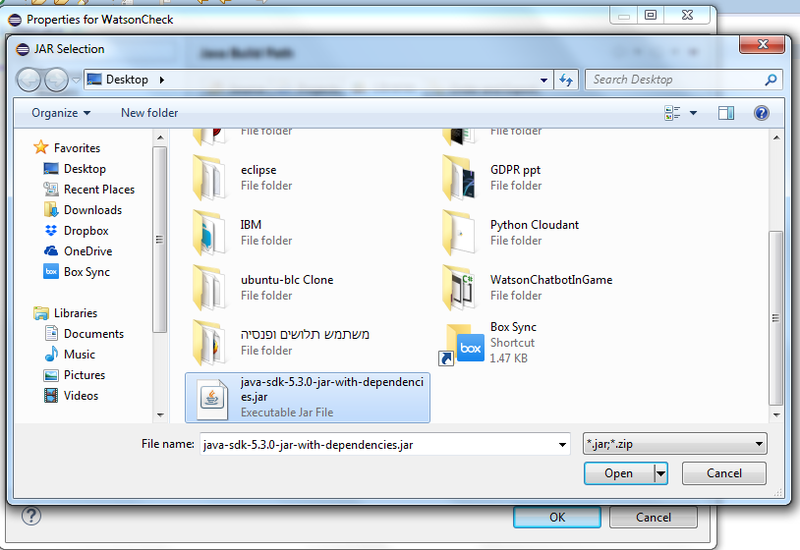 //Import gives you access to the classes inside the jar file you used. //Creating the class of the service. Make sure to insert you service username and password. //The text we want to analyze. You can insert any other text you like. //Entities and keywords are parameters you get back from the service about your text. //Take the parameters and send them to your service for resutls. Go to the NLU Service and click Create. If you get errors about missing spaces, try to change the regions. If you don’t have any space, you need to create new space. 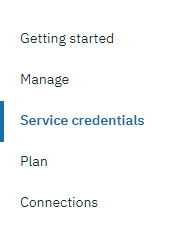 After you create the service, select Service credentials from the left menu. Click New credential to create a username and password, and then click Add. Click View credentials and copy the username and password to the code. Now that you’re familiar with the Waston Java SDK, you can use other Watson services. 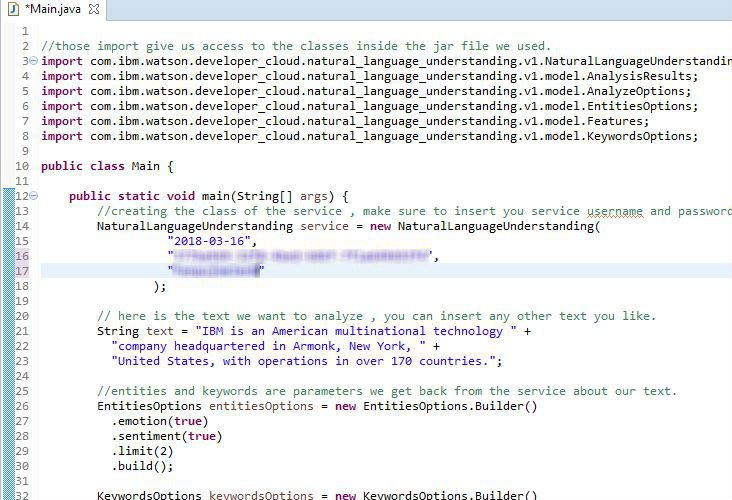 Try to call another Watson service: Language Translator. Natural Language Classifier. Personality Insights. Text To Speech. Visual Recognition. Tone Analyzer. Watson Natural Language Understanding Get started with Natural Language Understanding. 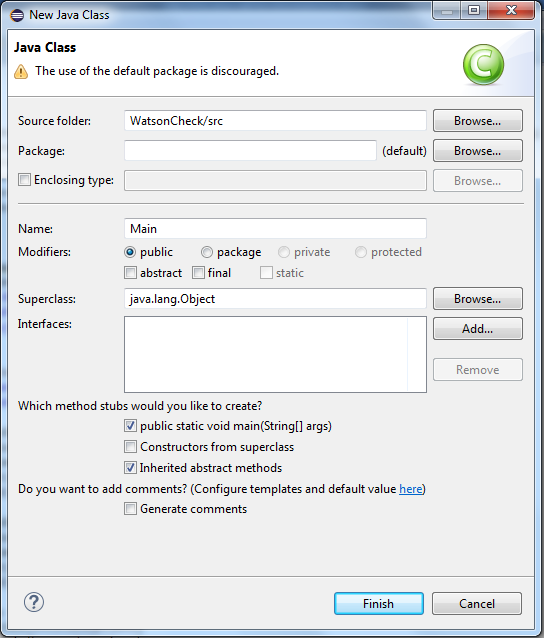 Watson Java SDK Take a look at the Java SDK to use the IBM Watson services. 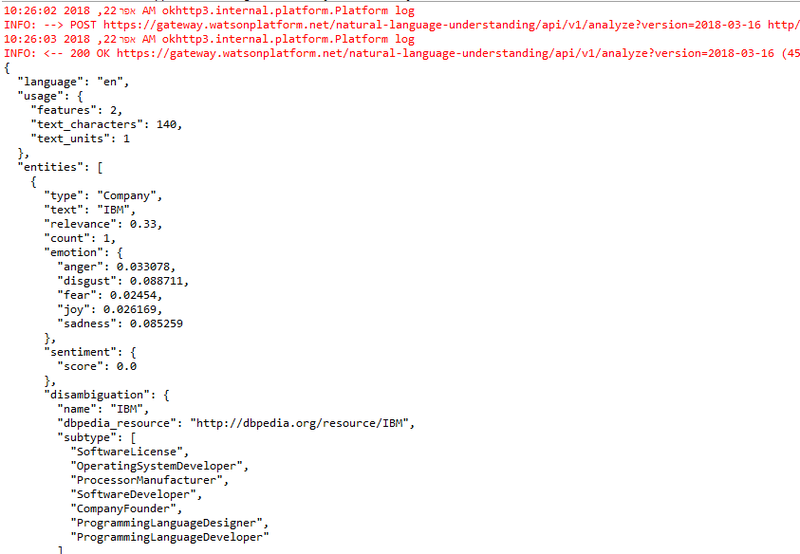 NLU API References Use the Natural Language Understanding service.